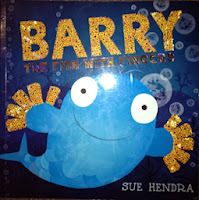 I have a book titled 'Barry The Fish With Fingers' which the children love. It's a picture book about a fish with fingers (get it - fishfingers?). As with all my lessons, I tried to get as much Islam in as I could. So after reading the book to the children I asked them, do fish really have fingers? Of course they all knew that fish don't have fingers. So I then asked them, who does have fingers? They all responded that they do. At this point, I asked what are some of the things that they could do with their fingers. The answers varied and I let the children demonstrated all the things that they could do. The next step was the important link in to Islam. I pointed out that there were so many different things that we could do with our fingers and I asked them, Who gave us our fingers? Now these children have been with me since the beginning of the year and they all knew that it is Allah Who gave us our bodies, so they all responded, Allah gave us our fingers. To which I asked them, what do we say to thank Allah for our fingers? Alhamdulillah! To continue with being grateful to Allah, I then asked them to imagine if we didn't have any fingers and to tuck their fingers into a fist. 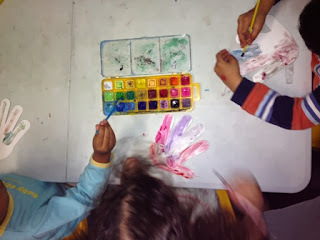 Now I asked them if they could pick up a pencil and write without fingers or eat, drink, play with their toys, tickle their friends etc without fingers. They could, but it was difficult. I reminded them that we are blessed to have fingers so we should always thank Allah for them by saying Alhamdulillah and to use our fingers for doing good. This brought up the subject of what is doing good with our fingers and avoid doing what is bad. Doing good is when we use our fingers to help others and not to hit or take things that doesn't belong to us. Subhanallah, from a general book there were so many Islamic teachings that were incorporated into it. As a challenge to yourself, pick up a book and see how you could incorporate some Islamic teachings into it for your children. 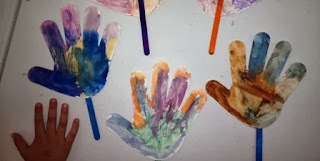 The craft lesson below was an extension of the Allah Made Fingers lesson. The children used water paint to decorate their hands. The children actually used their hands to play tag but on a hot day it makes a good hand fan. (When I was taking the photo a cheeky girl put her hand in).